Q: What is your policy regarding cell phones at camp? A: More and more, you read about the invasion of cell phones into camp life. They are disruptive to purpose, to program, and to developing camp friendships. Although cell phones have not been a problem at Camp Strawderman, we do not wish for them to become one. So, we ask that you honor our request that campers only bring cell phones to Strawderman for the sole purpose of taking photos/videos of their friends, activities and the natural beauty that surrounds them. Cell phone calls are not allowed at Camp Strawderman. We operate on an honor system. If a camper is seen using their cell phone for purposes other than photos/videos we will remove that cell phone and keep it locked up safely in the office until the camp session is over. Q: When is the best time to visit our daughter? A: Parents are welcome to visit at any time, although we discourage visits during your daughter’s first week away from home so she can fully immerse herself into camp life. Only parents, grandparents, aunts & uncles and siblings who are 21 and older may take a camper off grounds. When doing so they must check out at the office before leaving camp. Q: Where do we send mail for our daughter? 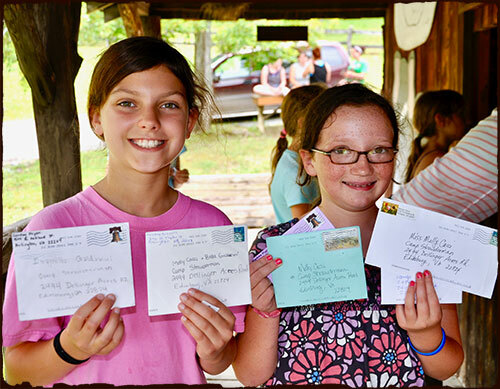 A: Campers love to receive mail from home, which is a real treat for both campers and parents when the 21st century norm has become paperless communication. The mail is picked up and delivered to camp every day. Please include your camper’s name and cabin. Q: Are care packages allowed? A: Yes, but parents are asked not to include food in care packages. It can be a problem for those campers with food allergies who live in the same cabin. Also, food stored in the cabins is not encouraged in order to promote the healthy diet already arranged and to keep the cabins from becoming a temptation for field mice. We suggest that you include items such as small games, magazines, and other things that might be fun to share. Q: What kind of medical care will my daughter receive should she need it? A qualified RN is on site 24 hours a day to meet your daughter’s health needs and there is a Nurse Practitioner available for appointments as needed. In addition, emergency facilities are readily available at Shenandoah Memorial Hospital in Woodstock, Virginia. Click here for a list of medical information requirements. Q: Are scholarships available to help defray the cost of camp? A: Because of the continuing support and generosity of former campers and friends of Camp Strawderman, we can offer a limited number of scholarships annually to campers who have financial need. If you are interested in applying for assistance, click here to download the application. Please return the application by May 1st. Q: What about laundry? How does it get done? A: Laundry is picked up once a week by a commercial laundry. This is recommended for campers who are staying longer than two weeks. For those who choose to send laundry out, laundry is charged to the camper’s account at the rate of $2.00 per pound. Q: What about electrical appliances? Can they be used at camp? A: We would like to take this opportunity to remind campers and parents that items which use electricity are not encouraged at camp due to the low number of outlets and the limited power sources available to each cabin. Camp Strawderman is a rustic camp, a place away from urban and suburban life. Also, parents, please note that Strawderman does provide a large fan for each cabin so campers do not need to bring their own individual fans. 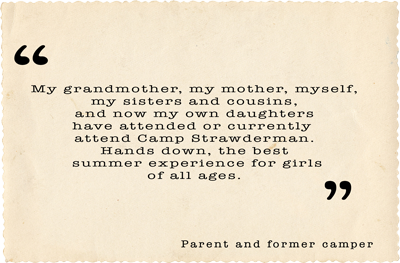 Q: Can you provide references who can recommend Camp Strawderman?